That’s all the opposition’s radio announcer could say about what he had just witnessed. It was a timeout in the first half of a Clan basketball game in the spring of 1996, and the gym fell dead silent as one of SFU’s central figures was injured. Yes, laying unconscious on the ground was the dilapidated, ratty, smelly, yet beloved SFU Gorilla. His clearly unrehearsed attempt at a trampoline slam-dunk — resulting in his head connecting directly with the rim and causing him to fall backwards onto the ground — was a sight the crowd had never seen before. The idea of a crazy costumed character causing a ruckus on campus, however, is a scenario that is all too common at SFU. SFU’s mascot didn’t die that night. In fact, he wasn’t really even an official mascot. However, the moment is indicative of this school’s bizarre costume culture, which seems to see a constant rotation of strangely dressed figures taking up residence on Burnaby Mountain. The need for a mascot at SFU was recognized almost immediately. Unfortunately, recognition is far from realization. The very first issue of SFU’s original student newspaper, The Tartan, printed in September 1965, included an exciting announcement for a contest to choose a campus mascot. Although the ad promised a prize that was “too fabulous to put in words,” the editorial staff seem to have never determined a winner, and the contest was never mentioned again as the paper folded within six issues. The early years at SFU certainly weren’t an ideal time to have a mascot. The radical nature of the school’s formative years made pretty much everything fair game for mockery and dissent. The few costumed individuals who turned up in the first decade of SFU’s existence were far stretches from the big, cuddly dog we have today — most were pranksters looking to raise a little hell every now and then. It would take more than a decade before any costumed character would truly win the hearts of the student body. In comparison to most schools, the number of yearly visits SFU receives from bears is relatively high. While the usual suspects have always been black bears from the surrounding forest, beginning in the summer of 1976, the school would become a frequent hotspot for an entirely different sort of ursine guest, native to a local fast food chain. In 1974, popular restaurant A&W first introduced their large, cuddly orange-sweater-wearing brown bear mascot, the “Great Root Bear,” in a series of TV commercials featuring a catchy tuba jingle. Within two years, the Great Root Bear was already ‘Ba-Dum, Ba-Dum’-ing his way up to SFU, and soon found himself fraternizing with some very prominent people on campus. At an event that took place near the swimming pool in March of ‘76, a photograph was snapped that showed the Root Bear holding hands with SFU’s then-president Pauline Jewett. It was the beginning of a nearly year-long love affair. The prank finally came to a dramatic climax in the fall of that year when the editors of The Peak took advantage of A&W’s promotional services and had the mascot come to a council meeting to present the president with a bouquet of red roses. Jewett was good natured about the entire event and jokingly expressed some reservation about making the relationship so public before taking the flowers and denying the bear a kiss. SFU students would continue to make use of A&W’s mascot — the Root Bear appeared at a variety of functions in the late 70s and early 80s, but as far as the public was concerned he kept his paws off the president from that point on. Since its inception, SFU has had a strong Scottish connection. The school is named after scottish explorer Simon Fraser, the first ever gift SFU received upon opening was a broad Scottish claymore, and the Athletics nickname “Clan” has its roots in the term for a kinship of people from Scotland. Finally, in the mid-1980s, they added the final piece of the puzzle: a gorilla mascot. While the origins of the SFU Gorilla — the Clan’s unofficial official mascot for more than a decade — aren’t very clear, it’s most commonly speculated to be due to the fact that someone happened to own a gorilla suit. But whether it was an old Halloween costume or a Salvation Army deal, when the suit got into the hands of Athletics marketing head Rod Harrison, a legend was born. Its cloudy origin story is befitting of a mascot that has been played by so many different people over the years that almost everyone who did it swears that they were one of the first. Beginning around 1985, this plain, ratty gorilla suit with holes in its knees was used sporadically. For years it was mainly worn at the corner of Gaglardi and Burnaby Mountain Parkway, and only occasionally at important games. In the early 90s, the suit was still being shared by a number of different performers: some game recaps describe a Gorilla sometimes capable of doing backflips, but other times barely able to stand without falling on his head. In 1993, the costume passed to a young business student named Victor Tamm, who accidentally became the first regularly performing mascot in the school’s history. Two weeks into his new job as assistant to head of Athletics marketing Rod Harrison, Victor Tamm was given a rather odd job, even for an intern. Harrison happened to be on vacation at the time, and when the Clan faced off against UBC in an early preseason basketball game, Tamm was told that “someone normally gets in the Gorilla suit.” He happily obliged, but didn’t quite understand that he wasn’t expected to fill in for every game. Tamm developed a routine which saw him banging his drum along to Queen, air guitaring on his back like Angus Young, and giving away t-shirts to the crowd, all of which helped evolve the Gorilla into a real mascot. He also helped promote SFU sports by running around campus in the suit, showing up in residences and around the AQ, and urging people to go to games. His efforts were a huge success, and the Clan soon doubled attendance to their basketball games. The Gorilla was a star attraction, especially to elementary and middle schoolers who attended the games in droves at the time. Tamm printed out a few photos of the Gorilla in action and soon he was facing hordes of tiny followers, asking for his autograph at every game. The Gorilla would even take a few trips off the mountain, travelling with the basketball team to a playoff game in Washington where American fans made Tamm fear for his life, attending Vancouver Grizzlies press conferences, and appearing in a Canucks game intermission show. At the Canucks game, Tamm had a run in with the UBC Thunderbird. Before their scrimmage hockey game, Tamm told the T-bird to take it easy on him since he’d thrown his shoulder out. When the UBC mascot didn’t listen, the Gorilla beat him up in front of the entire Pacific Coliseum. Tamm says it was easy to get the best of him since his lack of a big-head made him freer in his movements, so he could make it look like he was wailing on him with abandon. As Tamm’s successor would soon learn, being inside the Gorilla costume had its advantages, especially when it came to UBC attacks. While Tamm would secure a job at the termination of his internship, his legacy as sports marketing intern created a brand new requirement for the position. According to James Phillips, who took over Tamm’s job in the fall of 1995, one of the main interview questions was: “do you fit into a gorilla suit?” Phillips did, and was immediately thrown into the fire with a novel challenge: he was a first-time mascot going to the Shrum Bowl. Held almost annually until 2010, the Shrum Bowl was SFU Athletics’ premier event. It was the one time a year SFU played football against UBC, but what occurred on the field was often a sideshow to what took place in the crowd. Alcohol consumption was high, mustard and ketchup bombs were always on hand, and mascots were clear targets for mischief. In 1993, the Gorilla’s head was stolen by some UBC fans during a game held on SFU turf, so when Phillips made the trip out to Thunderbird stadium for the ‘95 instalment he knew he was in for a treat. It only took a single snap before the UBC Thunderbird ventured over to taunt SFU’s fans. In an ill-advised choice, he specifically targeted the SFU wrestling team. Apparently, the mesh fence separating them was nothing for 10 wrestlers, all of whom broke through and gave the UBC mascot a good pounding. Phillips, the opposing mascot, was soon charged by a number of vengeful UBC fans. He tried to swat them away with his drum but was eventually overwhelmed. Pulled out of the dogpile by security, both mascots were escorted from the stadium. Even away from the game, Phillips said that the Thunderbird continued to challenge him to a personal fight, because his drum had allowed him to avoid the injuries the Thunderbird had sustained. Phillips’ job settled down after that, although the Shrum Bowl incident did help inspire him years later when he co-produced and co-directed a documentary entitled Behind the Mascot, which premiered at the Toronto Film Festival in 2004. After Phillips was hired as head of marketing, the costume was passed on to a rotating group of athletes — after all, it seemed wrong to have a prominent professional staff member continue to wear the Gorilla suit. A young track athlete named Hidayet Arslan wanted to take the Gorilla’s basketball routine up a notch. He asked if he could perform a slam dunk off a trampoline during the game’s first time-out, and Phillips said “great,” without thinking twice. He showed up to the game and witnessed what is still the most talked-about mascot blunder in school history. Although Arslan did return to the game after slamming his head into the baseboard, the first ever rule for SFU’s mascot was instituted: no trampolines. This didn’t turn out to be an issue, as developments were already underway for the creation of new mascot, who would not only be incapable of dunking, but would hardly be able move. In 1995, a major shift occurred in SFU’s Athletics department when inaugural director Lorne Davies retired after 30 years on the job. New athletic director Mike Dinning came in with a desire to break down the barrier between varsity athletics and recreation. He sought to remove the exclusivity of Clan Athletics apparel and make it available for purchase by any student. Before Dinning could open his new sports shop, however, SFU’s logos and image had to go through a rebrand because, well, they were all stolen. The Clan’s primary logo at the time was a exact replica of the NFL’s San Francisco 49ers’ interlocking “SF,” slapped in front of a maple leaf instead of an oval. The Gorilla also posed problems, not only because the NBA’s Phoenix Suns already employed a similar mascot, but also because Dinning agreed that it made absolutely no sense. Dinning and a committee which included former-Gorilla Phillips started working with graphic designer and SFU alumnus Clay Yandle to design a new mascot. Finally taking the school’s Scottish tradition into account, a Scottish Terrier was chosen in 1996 as the unanimous choice for the new mascot; his name was McFog the Dog. Combined with the tongue-in-cheek reference to Burnaby Mountain’s normal state of clarity, Dinning loved the name and Yandle submitted two separate McFog designs, one aggressive and angry, and the other one more child- and family-friendly. Dinning chose the latter, but while McFog’s image was being sold on everything from water bottles to t-shirts at the new sports shop, students were less than impressed by him. Many felt that the new kilt-wearing, mustachioed terrier was simply not intimidating enough. One Peak writer claimed to have seen McFog “taken down from behind and mugged by three pre-teenagers” and lamented that he wasn’t forced to enter into a cage match against the Gorilla to earn his place. Another source of ridicule and difficulty for performers was McFog’s enormous head. It was so large that it caused the person inside it to frequently tip over, rendering “McFog the Log” almost immobile. While McFog was also treated to a Shrum Bowl assault in his first year, keeping up with tradition, his need for a handler and difficulty moving didn’t allow him to pump up the crowd like the Gorilla did. By 2003, McFog was gone. In an attempt to strengthen community spirit at SFU, Student Services acquired the rights to McFogg’s image in 2008. Yandle was once again tasked with updating McFogg, keeping his family-friendly vibe while making him more ferocious with a more muscular frame. Student Terry Forst, an active member of orientation and student life at SFU, would be the first person inside the new McFogg suit. He rotated mascot duties between a group of students, bringing new consistency to McFogg’s exaggerated movements by teaching movement classes with a friend from the theatre department. The new costume was not without its problems, however, and Forst found himself in a bit of an embarrassing situation at an open house event in May 2008. As he started to walk through Convocation Mall, Forst became acutely aware of the fact that he was skinnier than the recommended waist size of the costume when his velcro kilt slowly started to slide down to his knees. While trying to let his handler know of the situation without speaking and ruining the illusion that McFogg was a real giant anthropomorphic dog, SFU’s mascot flashed the crowd. Suspenders were added to McFogg’s look following the incident, and he has avoided exposing himself ever since. After a successful run under the watch of Student Services, McFogg returned to Athletics in 2010 and can be seen at most varsity sporting events as well as any student event that requests his presence. However, the McFogg costume still doesn’t allow for the most agile of performances. A handler is required, the person in the suit can’t stay in the suit for over 20 minutes without a long cooling break, and the head still contains a rather bulky fan, but McFogg has finally found a place in the community’s heart. While his technical challenges have contributed to McFogg being an ‘inside dog’ that isn’t allowed out much for football games, he does keep up with his duties and even has his own Facebook and Twitter pages. McFogg isn’t alone on campus these days in the crazy-costume game. 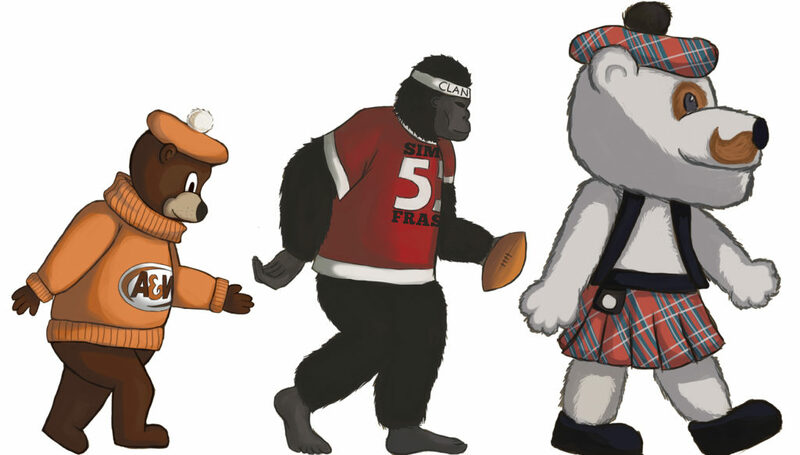 While they may not realize it, many students have continued the traditions pioneered by the Gorilla and even the Root Bear. The most notable of these are the SFU Power Rangers, a group of students joyfully mixing promotion for student government with 90s nostalgia and super-tight spandex. Besides promoting EDM concerts, passing out candy and unintentionally giving freshman girls lessons on the male anatomy, they’re joining a long, costumed battle against SFU’s ‘no-fun’ reputation. So before you dismiss SFU as a concrete prison, maybe just pick up an odd costume, put it on, and embrace everything this place has to offer.